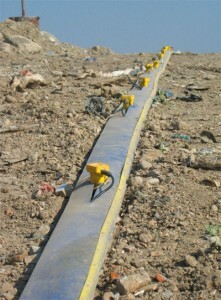 Crawl is a seismic land-streamer suitable for acquisition both on paved and unpaved road and rough areas. It can be equipped, on request, with iso-oriented accelerometers or velocimeters, choosing the type and center frequency. Number and distance between the sensors are customizable. The contact between the sensors and the ground is guaranteed by its own weight. Crawl can be shipped with no sensors, so third parts can set their own sensors on fixing systems. The standard configuration includes 48 velocimeters spaced 1.25 m, the possibility to position the seismographer at both ends, outputs for cables for trigger systems long the streamer. Crawl is customizable and adaptable to any kind of needs.